I am very fortunate to have got included in the cooking challenge and i thank srivalli for accepting me in the challenge.This is 4th challenge and since the beginning i had my own doubts whether i deserve to be in the challenge.After i made this muruku all my doubts are cleared,muruku came out so well just like what we get to eat from swahagruha back home.I can't wait to make this for my mom and sisters. If you are using more quantity, you can get it ground in rice mil, else use your mixie to grind both Rice and Urad dal. First grind rice into a fine flour, keep it aside. then grind the urad dal to fine powder. In a wide vessel, take both the flours along with salt. Mix well. Add cumin, Sesame seeds and asafetida powder to the flour, mix well.And finally add the butter. Gather everything well and you will get more of a crumbling mixture. Now slowly add water and knead a dough which is little more softer than the puri dough. Take the Muruku Aachu, wash and wipe it clean. Then divide the dough into equal balls. 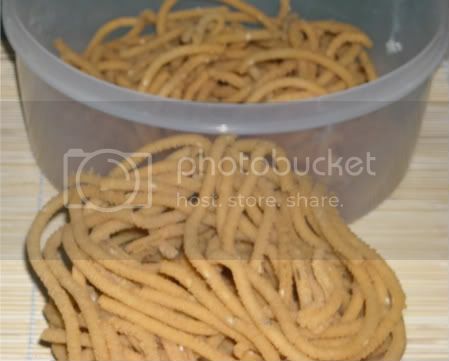 Fill the Muruku maker with the dough. You can either press it directly over the flames or press over a paper and gently slide it down the hot oil. Thank you srivalli for this wonderful recipe. This is my entry to the cooking challenge started by srivalli. Murukku looks very crispy! Even my kids love murukku and crunch all day! lovely attempt dear..it has come out nice..
Looks very crispy and yummy! lovely recipe and it turned out great! ohh you got a nice shape saritha looks crisp. humm nice click too. 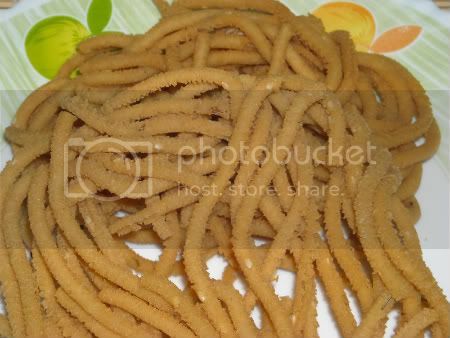 yummy and crispy murukku Varunavi.